Last week, we celebrated the birthday of my forever best friend, ultimate confidante, and #1 person I go to when I need advice or an opinion on just about anything: my mom, Tania. Since my mom lives about 10 minutes away from me, I see her just about every other day and I honestly wouldn't have it any other way. Although some might think that would be an annoyance having their mom be so close in proximity, I actually love it. Even though my mom and I look nothing alike, we are pretty much identical when it comes to our personality and interests, and she almost always knows exactly what I'm thinking and feeling. To put it simply: no one understands me more than my mom, and I don't know what I'd do without her. Alex and I decided to gift my mom this year by taking her to our favorite summer activity in Los Angeles: seeing a screening at the Hollywood Forever Cemetery via Cinespia. Alex and I are OBSESSED with going to Cinespia screenings and have been going at least twice every summer for years. Some of our favorite screenings over the years include: Purple Rain (which they played right after Prince passed away), The Fifth Element, Scream, and the original Psycho. The movie that we took my mom to see this past weekend was the classic film, The Graduate, which was amazing to see on the big screen. The night was perfect with great weather, prime seats, and the most delicious food spread for our picnic before the film started. 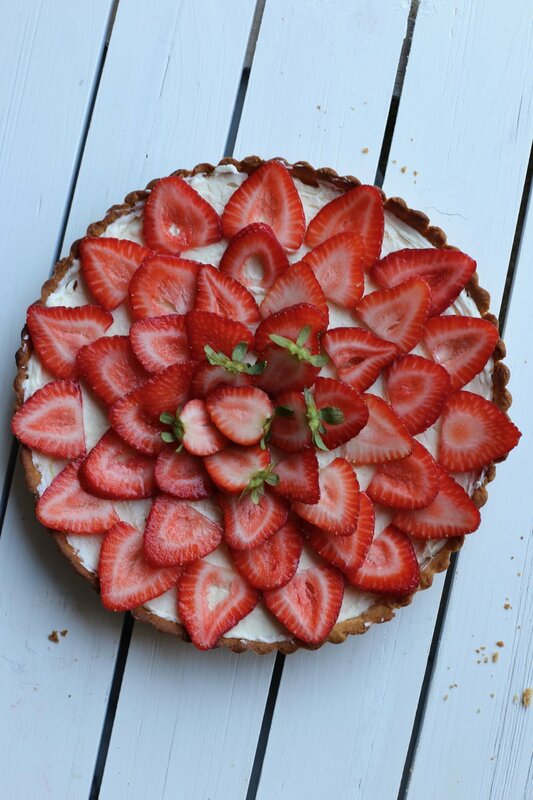 Every year, I always bake up a birthday treat for my mom, and this year she requested a simple yet very delicious fruit tart. 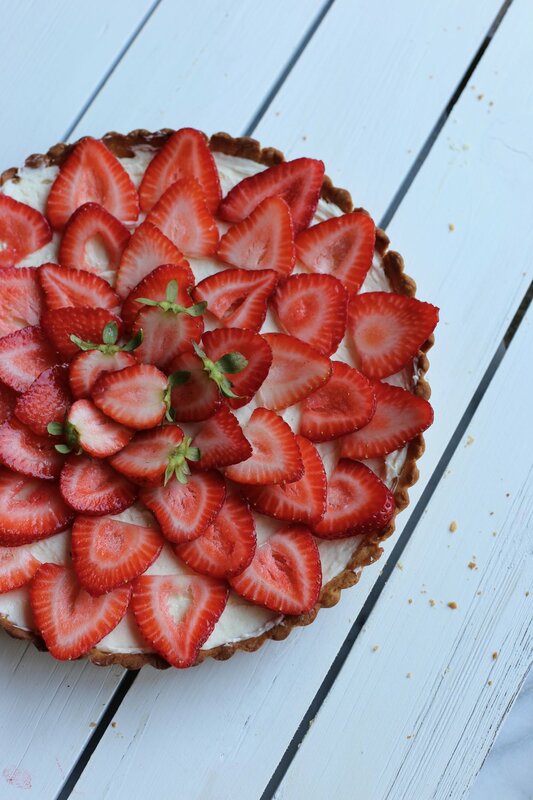 Funny enough, I had actually never made a fruit tart before and so I set out to make the ultimate version of one. I made the crust of the tart a pâte sablée, or a French shortcrust. The difference between pâte sablée and a pâte brisee, which I made for my blueberry galette in a different post, is that pâte sablée is sweetened with more sugar and uses room temperature butter; the process of making the dough is pretty akin to making cookie dough. The end result of this particular pastry dough is not flaky like pâte brisée, but actually more crisp and sandy-like. Therefore, pâte sablée is the perfect base for a fruit tart. Now let's talk about the filling: a creamy mascarpone filling that is just slightly sweetened, with a hint of lemon and vanilla. It pairs perfectly with the sweet pastry dough and will not make you feel too full after having a slice or two. A very important note for when making the filling is that the mascarpone and heavy cream NEED to be at room temperature, or else the mascarpone may curdle. I would suggest taking these ingredients out of the fridge at least an hour before working with them. Because we are filling the dough with a mascarpone filling that does not require any baking in the oven, the dough must be blind-baked. This requires rolling the dough out into a 9-inch tart pan with a removable bottom, covering it in foil, and filling the pan with either pie weights, rice, or dried beans. I recently bought these pie weights and they worked perfectly. One last thing: feel free to use any fruit of your choosing for the topping! 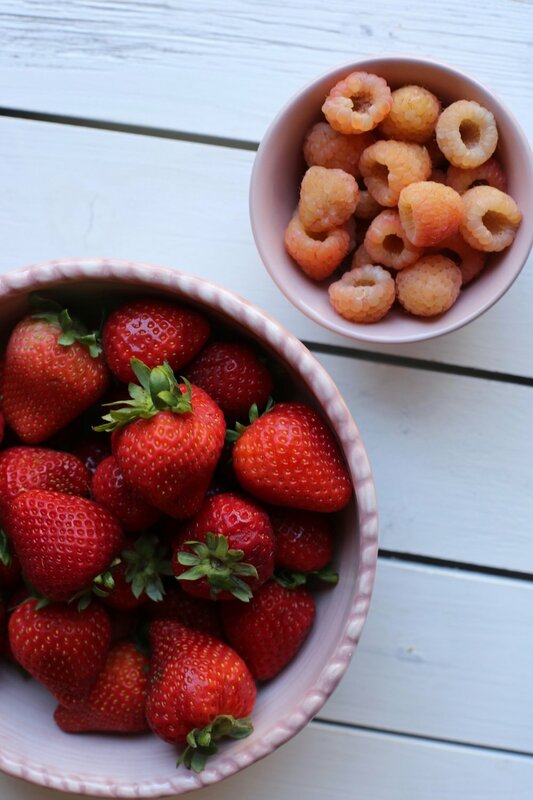 Strawberries, kiwi, peaches, bananas... anything that looks good and is in season at your local grocery store! I was going to use the sunshine raspberries pictured above, but the strawberry design I made was just too beautiful to change. In the bowl of a standmixer fitted with the paddle attachment, or, in a large bowl if using a hand-mixer, cream the butter and sugar together on medium speed until creamy. Add in the egg yolk and mix until fully combined. In a separate smaller bowl, whisk the flour and salt together. Add this to the butter/sugar mixture on low speed, and mix until the flour is no longer visible. Do not overmix. The dough should be similar to a cookie dough. Transfer the dough onto a sheet of plastic wrap and shape it into a round disk. Wrap the dough up tightly and refrigerate for at least 1 hour, or up to 2 days. When you're ready to roll the dough out, allow the dough to sit out at room temperature until it's more malleable. Place the dough in between two pieces of wax or parchment paper and roll it out to an 11-inch circle. Be careful to not make the edges too thin. 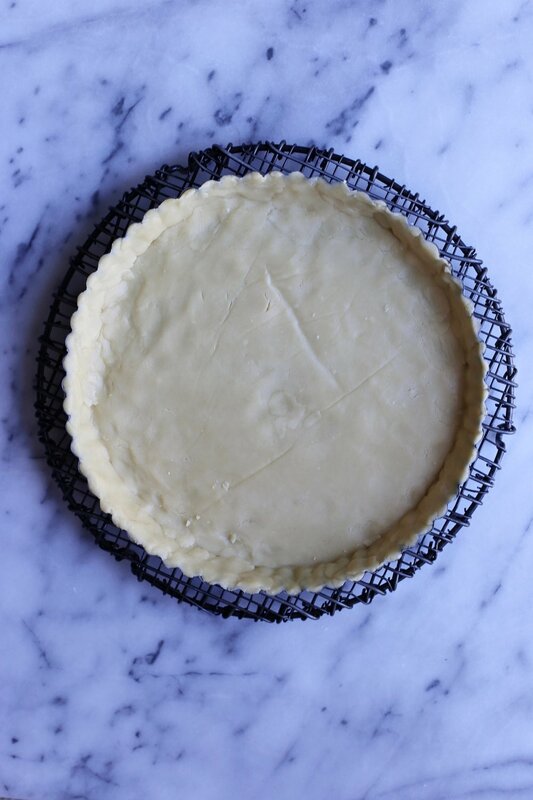 Take off the top layer of wax paper, and carefully invert the dough onto your 9-inch tart pan. This dough is very forgiving, so if any areas break off in this process, simply just patch and press the dough together - no one will ever know. Trim off any extra dough that is hanging over the sides. Cover in plastic wrap and place the tart pan in the refrigerator for 30 minutes. Line the tart pan (including the edges) with foil, and fill the pan with pie weights, dried beans, or uncooked rice. Bake in the oven for about 15-20 minutes. Take the tart out of the oven and remove the pie weights and foil. Place the tart pan back into the oven for another 3-5 minutes until golden brown. Times may vary depending on your oven, so I would check the tart both when covered in foil as well as after, because you do not want to burn the crust. 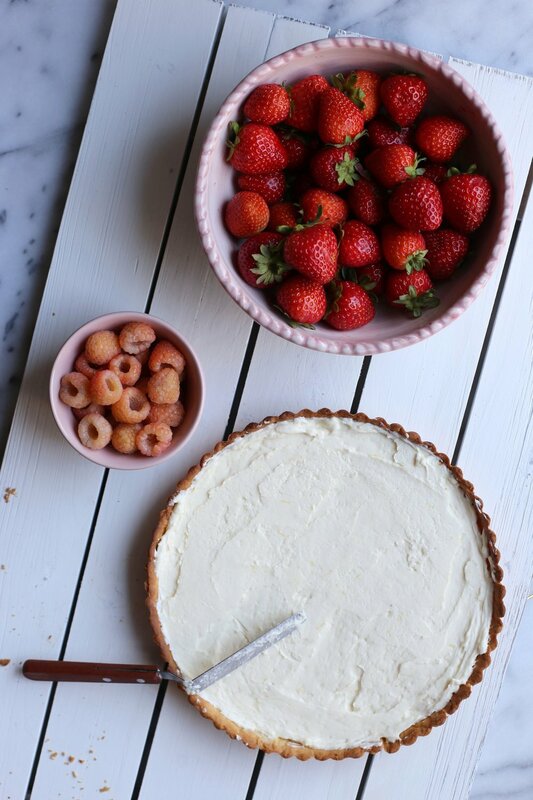 Let the tart cool completely before adding the mascarpone filling. In the bowl of a stand mixer fitted with the paddle attachment, or in a large bowl if using a hand-mixer, add the mascarpone and mix for about a minute on medium-high speed. With the mixer on low, slowly add the heavy cream to the bowl. Do not add the cream all at once or it may curdle the mascarpone. Scrape down the sides of the bowl. Add the sugar, vanilla extract, lemon zest and juice, and beat on medium-high speed until the mixture is fluffy and light, about a minute. 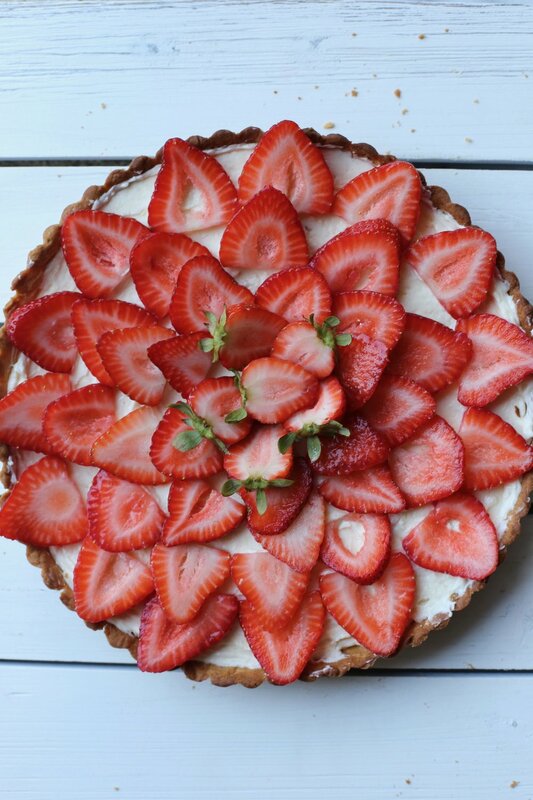 Evenly spread the filling into the cooled crust and top with your fruit toppings of choice. Dust with confectioners' sugar if desired. Store in the refrigerator (this makes it easiest to cut the tart).